Easy, completely delicious Honey Beef Lettuce Wraps with sweet and savory Asian flavors. Whip them up in about 20 minutes for a tasty appetizer or main dish! This post is in partnership with Kikkoman® USA, all opinions are my own. I am notorious for ordering appetizers as my main dish when we go out to eat. Like mother, like daughter I guess! I remember my mother always getting “the sampler” if the restaurant had it on the menu, with a request to bring it out with the rest of the entrees. When I worked at a Chinese restaurant throughout high school, I would almost always order an appetizer (or three) to-go at the end of a long shift in lieu of dinner. Cheese wontons, pot stickers, and lettuce wraps were my go-to’s! Since I no longer work at the restaurant, I like to make my own at home and this version I’m sharing with you today is easily my favorite yet! 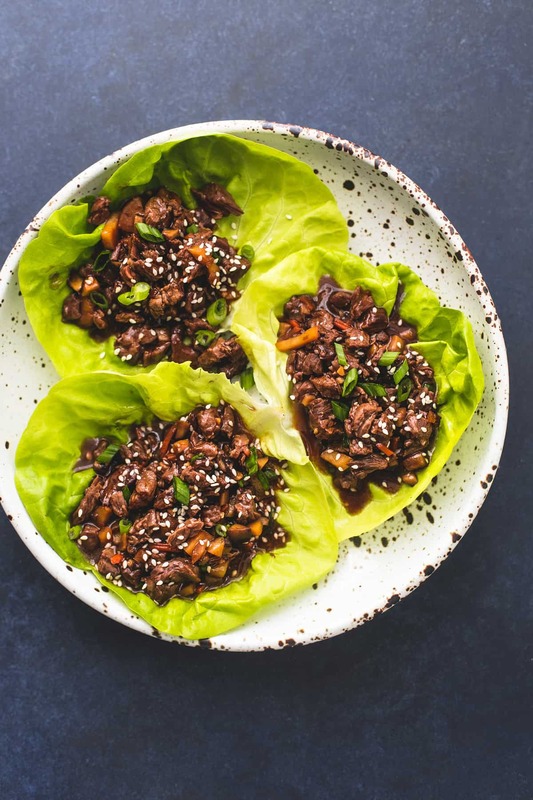 These honey beef lettuce wraps are SO delicious and very easy to make. In about 20 minutes, you’ll have yourself a tasty appetizer; or in my case, a tasty meal! They have tons of flavor and are easy to customize to your personal preference. The base is made from finely chopped beef, mushrooms, carrots, and water chestnuts sautéed in a skillet with a bit of sesame oil. 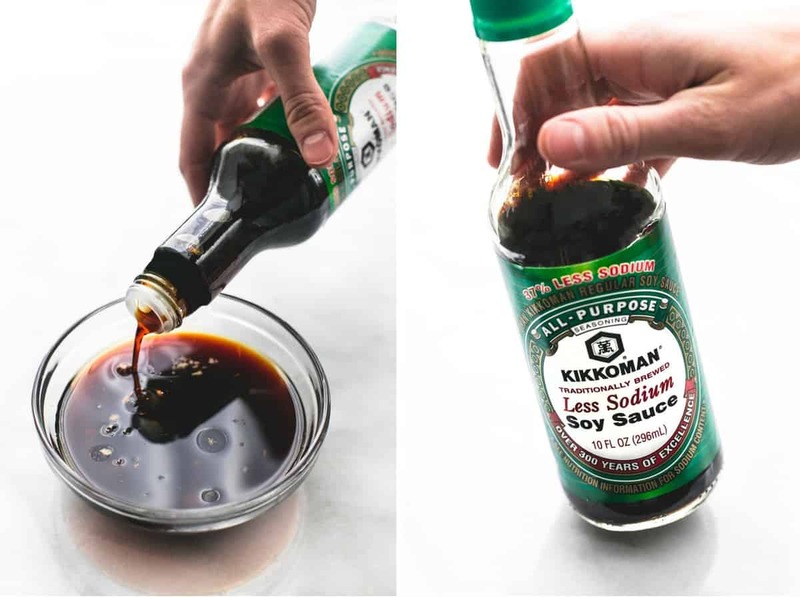 The sauce is made with hoisin sauce, minced garlic, honey, ground ginger and Kikkoman® Less Sodium Soy Sauce, which is perfect for home cooks who are looking to cut down on their salt intake without sacrificing flavor. Cooking up your favorite restaurant-style Asian-inspired dishes at home might seem intimidating, but Kikkoman® products make it easy-breezy to bring these delicious flavors into your own kitchen. What kind of lettuce do you use to make lettuce wraps? 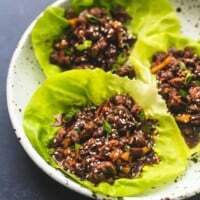 I like to use butter lettuce for my lettuce wraps because it is soft enough that it is easy to roll, but firm enough to hold all of the filling without tearing or leaking juices. Another popular choice is iceberg lettuce, because it has a nice crunch to it and compliments the filling really well. Either way, you can’t go wrong, just make sure you’re picking a lettuce that has large, broad leaves. What do you serve with lettuce wraps? If you are serving lettuce wraps as an appetizer, they go well with any favorite Asian-inspired main dish like Sticky Lemon Chinese Chicken, Spicy Korean Beef Noodles, or this super popular Slow Cooker Broccoli Beef. If you are serving the lettuce wraps as a main dish, try serving them with a side of Sheet Pan Chicken Fried Rice, Kung Pao Noodles, or Baked Cream Cheese Wontons. 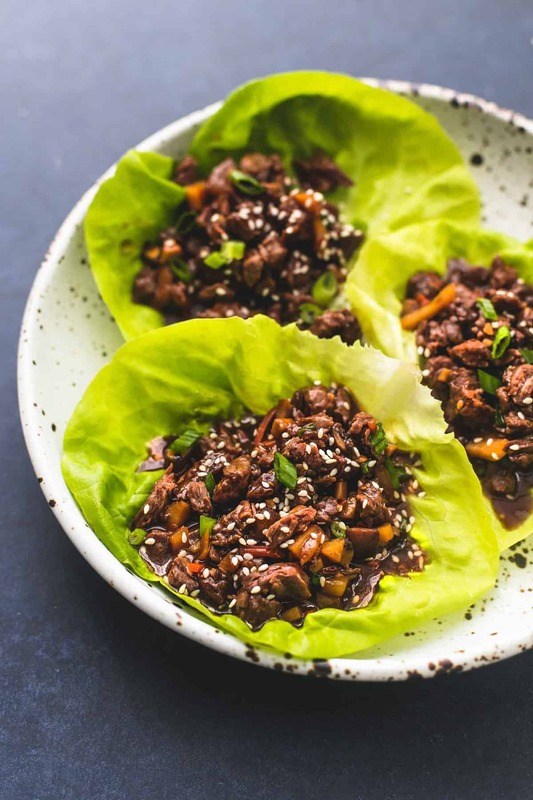 These Honey Beef Lettuce Wraps are the perfect blend of sweet and savory and come together so quickly, there’s no reason not to have them as a main dish or appetizer any night of the week! You can add a little heat by stirring in a bit of crushed red pepper flakes or chili paste, and easily add any other favorite vegetables to make it your own. Enjoy! 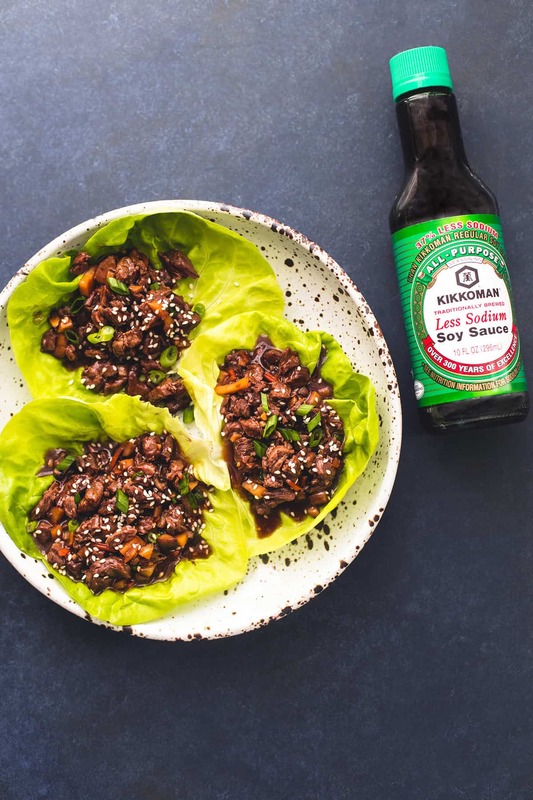 Easy, completely delicious Honey Beef Lettuce Wraps with sweet and savory Asian flavors you can whip up in less than 30 minutes for a tasty appetizer or main dish! Finely chop beef into 1/4-inch pieces. 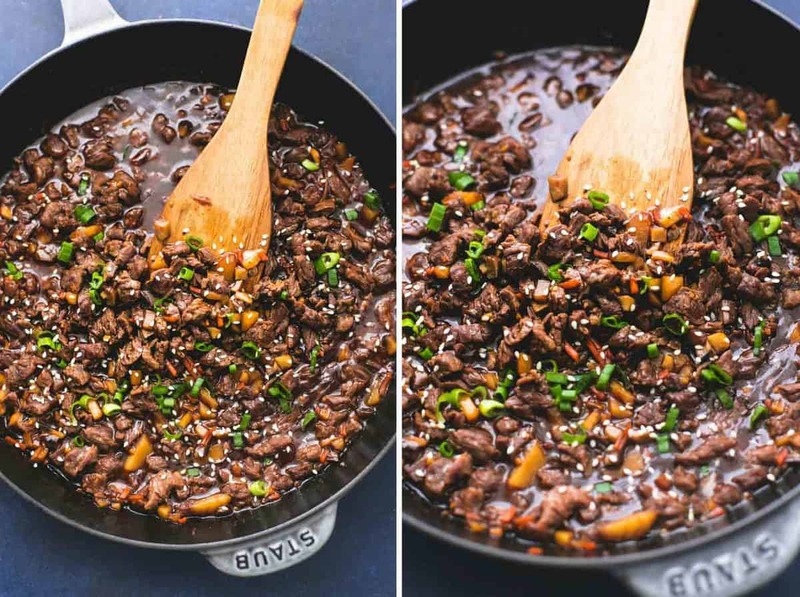 Drizzle a large skillet with sesame oil, then combine beef, mushrooms, carrots, and water chestnuts and stir over medium-high heat for 3-4 minutes until meat is mostly browned. Stir together soy cauce, hoisin sauce, honey, rice vinegar, garlic, ground ginger, and crushed red pepper flakes. Stir sauce into beef and vegetable mixture and saute over medium heat for 3-5 minutes. Sprinkle with sesame seeds and green onions. Scoop beef mixture into butter lettuce leaves and serve. Serves 3-4 as a main dish, or up to 8 as an appetizer. Looks & sounds fantastic ! Do you have any SUGGESTIONS on how to make this w/ chicken or pork intead of beef ?! Ground or finely diced chicken or pork would work well as a substitute! This recipe looks delicious. However, I have never heard of a “Carne asada” cut of beef. Does it have any other names and in the case that I cannot find that, what would be a good substitute? Would ground beef work? The package will ususually say “carne asada” on it, but if you can’t find it really any thin cut of beef will work! You can also use ground beef if you prefer. Carne Asada is typically made with Skirt Steak or Flank Steak. I prefer skirt. In this recipe she’s just using it as shorthand for “thinly sliced beef” it’s sometimes sold like this in grocery store meat sections in some parts of the US. Have you considered making this in the Instant Pot? There has to be a way … Probably end up with shredded beef instead, but that would be okay. Thoughts? You could definitely make this in an Instant Pot. You could do a pressure setting for shredded beef, or I would recommend the saute setting and doing it like a stir-fry just until the meet is browned, then switching to pressure cook for maybe 15 minutes. These look so yummy! Thank you for sharing. This post inspired a homemade “takeout” night for my roommates and me. We made this, your kung pao noodles, and your cream cheese wontons. They were all so delicious! Thank you for sharing. This was a big hit in our house! All 5 people liked it! !i think it wil be a staple meal in our house! This was easy to prepare and delicious. I didnt have any waterchestnuts ormushrooms so i substitUted celery and onions with some red pepper all diced. I also used ground beef. Next time i will Make it with the recipe ingredients, but i have to say, no one complained in my house tonight! Kelly- it sounds like you did a fantastic job using what you had on hand!! Thanks for sharing your experience with this recipe!